John “The Duke” Wayne could easily be considered the definitive movie action hero in cinema and with so many films under his belt from westerns to war, his movies were quite popular in his heyday. Of course, Wayne generally had one style of acting but ironically it worked, whether in action, drama, romance or comedy… The Duke may not have been a man of many faces but he did create some very memorable movies and moments. The story behind the Green Berets is quite simplistic at times where Wayne plays Colonel Mike Kirby, a man responsible for choosing and leading a team of Green Berets into enemy territory, Vietnam. Their tasks are simple (not really), gain control of a camp that the enemy is attempting to take over and also kidnap a North Vietnamese General. It's a challenge but the Duke and his men are definitely up to it and even though the acting is a little clichéd, the premise behind this classic war story is not that had me glued to the screen. A good effort for a 1968 film! The Green Berets was quite a political movie in its time thanks to its clever propaganda, although not as strategic as The Green Zone (2010). 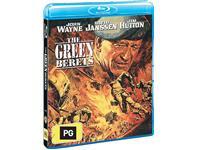 Dubbed as one of the world’s first Vietnam War movies, The Green Berets is quite a serious story at times, that is heavily laden with some impressive action scenes that would be the archetype of Hollywood war movies to come. With an impressive budget, directors Ray Kellog and John Wayne manage to retell a particular aspect of the Vietnam War quite well and although John Wayne isn’t that spectacular as Kirby, he does add an element of realism to the film. It's also good to see George Takei (Star Trek fame) play a captain in the film... stereotyped? Yes but interesting in a historical movie way. At the end of the day, The Green Berets is an interesting part of Hollywood and you can see two strong themes in this movie, American patriotism and the anti-war message. Wayne plays his generic hero but manages to ground his character, making him quite realistic and relatable at times, especially when the action heats. I know for a fact that I would follow him into battle! Definitely a film for those interested in early Hollywood or for lovers of film in general.